Exmouth 13 ‹ Series 10 Reversions ‹ Flog It! Antiques programme. Paul Martin is in the seaside town of Exmouth with experts Christina Trevanion and Will Axon. Browse content similar to Exmouth 13. Check below for episodes and series from the same categories and more! Welcome to Devon and the seaside town of Exmouth. -And what are you going to do with all that lot? 'Exmouth has been a popular tourist destination ever since the 18th century. 'bringing with it mass tourism, and it looks like we've also brought out quite a crowd today. 'Fingers crossed a few gems from that golden age make an appearance. Oh, what is it that you've got? A Victorian scrapbook. That's beautiful, isn't it? The colours are still so good. and I don't think either of those are going to make that water jump. I'll give you this and we'll have a closer look inside. Let's get the doors open and get the show on the road. 'While everyone takes their seats inside the pavilion, here's what's coming up later. I actually bought it at a jumble sale. I paid 50p for it. -Bought it from a jumble sale? I hope it sells, you know. I tell you what, this is the life. This is the life every schoolboy wants. Everybody is now safely seated inside. This is where it gets exciting. Who is going to be one of the lucky ones to be whisked off to auction? We'll find out, because Will is first at the tables. Let's see who he's talking to and what he's found. Well, Sue, I saw you looking very glamorous, I must say, in the queue this morning. As soon as you pulled this little picture out of your bag, I knew exactly who it was by. -Well, I knew it was Adam Buck but I don't know anything about it. I looked on the internet and found nothing out. -Cos he's actually a pretty prolific artist. Sort of early 19th century. that's really when Adam Buck was painting his best work. -Is it something that you've bought yourself or something you've inherited? -It's been inherited by the family. My mother. And does she remember where it came from? Erm, it came down the family from my grandmother's side. OK. So what I'm edging towards is whether or not this is a family member. Well, that's what I'm wondering, cos there's two. My sister's got the other one. -And is the other one a gentleman? Is there anyone in the family around this date? Have you got the family tree? I haven't gone right back on the family tree, so I really don't know. -That's the trouble. Unfortunately, you run out of people to ask, as well. -Well, this is the problem. The work itself is very typical of Buck's work. She's wearing this wonderful hat with, I suppose, ostrich feathers. -Ostrich feathers in her hat. -And this delicate face with the eyes and the little rose lips there. that I'm not very happy about, is the colour of this frame. -I think someone's got the old spray paint out. -Because looking at the back, it's actually an old frame. and the way the frame's been constructed is in an old way. It's got this rather nice label, as well, on the back. Carver and Gilder, picture frame manufacturer. Yeah, could've come with it from another frame. Now, value-wise, have you had any thoughts as to what you think it's worth? No, but I would hope it's worth more than £100. Well, I think you're in the right sort of ballpark figure. I was thinking 100, 150 as an estimate. -cos she's a pretty face, isn't she? in dress like that, I think 100 to 150 is on the money. I think you should say goodbye, cos I'm pretty confident she'll find a new home. I've just been joined by Colin and this little chap here in the middle. Tell me, this is a wild guess, but are you in the tyre business? Yes, I was. I was a company director for Southwestern Tyres. Looking at this, I'm pretty sure this is compressed card or felt. Looking at it, you can see all brown grinning through. so you can put a bulb up inside so they light up. -This one is a much earlier one. This is very early 1950s. -So does that correlate with how long you've had this? and I bought this, more or less when I started, off a local coach dealer. -I cannot remember. I think I gave him a tyre. A tyre? That's a fair exchange, isn't it? And where have you had this bolted down? Onto the worktop? -No, it was on top of my lorry. -How long was this on top of the lorry for? -Wow! He's had a good life! -Did you give him a name? -No, I didn't. No, I didn't. -It's in relatively good condition. It needs a jolly good clean. -So has this been in the garage in the last few years? -It's been in my attic. I retired so I sold the lorry and took this off. I do like it. There's something about it, isn't there? that iconic branding, which sticks with you. These were only available to people in the trade. People like you, dealers, and the general public couldn't buy these back then. So when this comes on the market, I think people will fight for this, if you're into automobilia. -I have no idea whatsoever. I think you'd be looking at £200. Unfortunately, it's not. It's had its knocks and its wear, but that's only to be expected. It's been on top of a lorry for 20 years. Let's get this into auction with a value of £80 to £120. And put a reserve on, if you're happy, of around £60. -I'm happy with that, yeah. the automobile collectors and the trade collectors will love this. -Hilary, you've brought in this collection of silver today. -which has got Bristol & District Table Tennis Association on the front. -So are you a table tennis fan? -Well, I was when I was younger. My father was one of the members of the Bristol & District Table Tennis Association. He was the treasurer. in recognition of the work he'd done for the association. -And he obviously represented his club and did a lot for the club. -He was mainly the treasurer. I think that's why he got this recognition. Well, what a lovely gift that they've given him. You've got the enamelled front. -The case is solid silver. -And it's hallmarked for Birmingham 1957. -And they've obviously engraved his initials in the top corner here. "Presented to AG Norman on his appointment as a life member, B&D TTA,"
because although it's hallmarked for 1957, it's contemporary within that two-year period. So it really is a quality piece. You've got this gilt interior, as well, which is really nice. -Just adds to the luxurious feel of it. Do you know if he ever used it? -Yes. In fact, when I opened it up, it still had little bit of tobacco in, which I brushed out. So that was the first item you brought in to us. And then you've also brought these very Art Deco teaspoons here, which are solid silver. -And they are hallmarked for Sheffield 1937. Maker's mark CB&S, which I can't track down. -I think it may well be Charles Boyton & Sons. -I'm not sure. Where have they come from? I don't know. They were my mother's, and she's long dead, I'm afraid. -There's nothing significant that I know of in her life at that time so I'm not sure how she got those. And then we've also got this nice retailer's label here for James Walker Ltd.
and those are hallmarked for London 1923. And that was when she was married first. -And her married name was Faracre and the F monogram is for Faracre. -So those would've been a wedding present in 1923. -Why have you brought them in? -and somebody else might enjoy them. It is quite difficult to put a price on the items because they are very different. -With regards to a value, I think what we would do is put them as one lot. Because the stronger items will help sell the weaker items. -So I think, at auction, we're looking at somewhere in the region of £80 to £120. and in your Art Deco spoons. OK? So we're looking at £80 to £120, maybe with a reserve of £70. -How do you feel about that? -Let's hope that Dad's many hard voluntary hours at the table tennis club pay off for you. -Judith, thanks for bringing in the pestle and mortar. What can you tell me about it, where has it come from? so it's about 55 years. He thinks that it was to do with his grandparents. It's certainly older than you or your husband remember it. So we are thinking sort of 1700s. at a big house in Tiverton. because it's so dense. You feel the weight of it, can't you? it's one of the few woods that actually sinks in water. It's so dense that it doesn't float. The pestle I think is probably associated, to be fair. I don't think they started off life together. -It's certainly done the job, hasn't it? It certainly fits in quite nicely. Have you given a thought of what it might be worth? We were just intrigued about it, really. we would like to bring it and see what we could be told about it. around the couple of hundred pound mark. Let's put it in, let's straddle that £200 mark. Let's put it in at 150 to 250. Fair enough, that should be fine. On the day, it could make 200 or 300 or £400. -I think the only thing to say now is, see you at the auction. seen some wonderful works of art and met some extraordinary people. and that's what happened when I was staying here in the Dartmoor National Park. I have two passions in life, art and animals. For me, this work is contemporary, it's fresh, it's alive. perfectly placed, but with confidence. and easy on the eye. to pick up a paintbrush and start to paint. who knew from primary school that she wanted to be an artist. is inspired by the moorland and the farm animals. -I'm so pleased to meet you at last. -Thank you from meeting up with me. Oh, crikey. Two are underway - one's for me, one's for you? You're working from photographs, I see. -I think that looks stunning as it is. I'm going to muck this up. So you start with a blank canvas. You obviously put a ground colour on straight away? Always start with the wash, it gives more depth to it. You've started with a charcoal-y, dark sort of colour. Are we hoping to put green grass on that? or a sky blue. Make it up as you go along. -Is that what you tend to do? Can I pick a brush up? I love your palette. but it works for me. But animals are your thing? I need a lesson, I want to learn how to paint like this. Where do we start? You've started with this outline. and build it up from there. Did you always paint like this? and it's just the way I paint now. -Can I start more on the background? if I begin to feel confident with a bit of blue. so maybe start building up some depth. -you use the same brush for the same colour? to stop using too much turps. so work with a sort of dry-ish brush. I don't know if that's the right colour to use or not. -I think it works. The secret is to paint fast. whereas mine is sort of in the distance, frightened. -Is his work a big influence to you? -More so than any other artist? -and do this kind of thing. and imaginative, and I think that's what good art is all about. I think it's always best to use a big canvas and a big brush. -Don't be frightened of it. -It's very therapeutic, isn't it? Can you give me a tip about what to do for some of these curls in the wool? That's the problem, it's all feel, isn't it? 'the feeling and the movement of her subjects. 'capturing the depth and character of each animal. so I can have a look at it, like that. It's just something I do, it helps me to look. What will you look for when you stand back? or helps you to see where to go when you're a bit stuck. Will you work on more than one canvas at a time? pick them up and then put fresh colours over the top. What do you like painting most? Is it sheep or would it be the cattle, or cows? Sheep, I think. There is something nice and familiar. I don't know, childhood memories or something. and it makes them smile, you know. Your work does that, it puts a smile on people's faces. And I think that's a brilliant quality. you don't understand the cleverness. This it's why I'm so grateful to have this lesson. I would never have the confidence to start like this at home. -Starting to relax into it now. Now I've lost its ear. Do you actually stand back and go, "Yeah, it's finished,"
and want to put more on? You can go home thinking, "Wow, I've done a good job today,"
come back the next morning and think, "No way. "How did I think that was good?" when you know it is finished? When you are actually pleased with it, I suppose. "Ooh, I've done OK there." -Cos sometimes less is best, isn't it? That's going to be my maxim. Right now I'm thinking less is best. -What do I do next? -That one's a bit huge. -and a big blob there. -Cos there's a lot there are, isn't there? Yes, cos all this area's quite light, isn't it? -you can keep going over it and over it. -Shall we have a look? Can you turn that back up? Did that help, turning it over after half an hour? -Thank you so much for helping me. -Can we carry on for a bit more? -I just think this is lovely. What a perfect day out. 'We have our first four items. 'Now we are taking them off to the sale. 'Let's hope we have a good result at auction. 'We're in Exeter at Bearnes, Hampton & Littlewood for our sale today. 'and the seller's commission here is 16.5% plus VAT. We had an original valuation which Sue was pleased with of £100 to £150. -Since the valuation day, you've had a chat to the auctioneer. -And you've raised that reserve to £200. -New valuation, £200 to £300. To be honest, I've sold prints by Adam Buck at £100 plus. The only thing that made me hold back a bit was the frame. This is it. It's down to the bidders. wearing a splendid hat. £150 is bid. -I hope it sells, you know. At £200. 10, will you? -No, it's going on the reserve. -Well done. Good for you for putting up the reserve. -It might have gone for much less. he would've got it at 100. Thank you. I've got very sweaty hands. Nice to meet you. -Nice to have met you. -Thanks for a good day. 'What a great start! Let's hope it continues. It's the Michelin Man about to go under the hammer. We've got a reserve of £60. I'm hoping to get around 80. Unfortunately, Colin hasn't made it in yet. because it is really busy out there. I'm expecting him to run through the door any second now and join with me in this wonderful moment. The seated advertising figure of a Michelin Man with mounting bracket. £45 is bid. At £45. At 45. At £55. And 60 now. And 60, will you? 60 in the doorway. -At £60 and selling it at 60. Sold. Here's Colin now. Look at that. I've literally just said to the camera, "The hammer's gone down". -Yeah, that's quite all right. -Colin, it's great to see you anyway. Can we make it a hat-trick with the pestle and mortar? Judith's here. What a stir you caused. I'm very pleased about that. with you at the table. You were ever so excited. -I'd love to have done that one, because this could fly away. And at £150 starts it. Well, it's gone. Top end, though, 280. -I'm very happy about that. Had a lot going for it, yeah? -Thank you so much for bringing it in. It belongs to Hilary, who's right next to me. -And this is your first auction. -You're having a bit of a tough time at the moment, aren't you? -and I'm staying with a very nice friend. -Stressful, isn't it, living out of boxes? -Good luck in your new house. Where is it? -In Exeter. It's sort of the other side of town. -You're staying in the area. -Cos I have an allotment and I want to keep it. -Where I'll be this afternoon. -We've digressed. We should be talking about antiques. Your lot is next. Good luck, Hilary. and a set of six George V coffee spoons, cased. All together. £70 is bid. At 70. 5. 80. 100. And 5. 110. 120. -He's looking at his book. prior to the sale. They've viewed it earlier in the week but aren't here. -to the calm of the allotment. -I will, thank you, Paul. -On a day like today. -Is that where you're heading off to? and so I should be, because I love antiques and everything old. on one of the best heritage railway lines in the country. This is the age of steam, so come on, I've got a train to catch. 'And that train is here at the South Devon Railway. 'the South Devon Railway Company and it joined the Plymouth to Exeter mainline. from this station, Buckfastleigh, to Totnes, which is in that direction. Now, you're probably wondering why I'm dressed like this. Today I have the opportunity to fulfil every schoolboy's dream. obviously under instruction from Chris and Dave, who are up here waiting for me. I am prepared to put in a full day shift. I've even got my steel-toecap boots on. So let's get dirty. Hello, guys! Pleased to meet you! I've got to say, you're immaculately turned out. -We might, but you won't. -How long have you been working on this railway line? -I've been a member since 1968. -Just before it actually started running. And I've been driving since 1993. -You've got the hardest job. You're the fireman. -No, you've got the hardest job. and put in a good day's shift for you. Is this really the apprenticeship for becoming an engine driver? -Did you have to be a fireman first? -You start off as a cleaner. and then under the guidance of the driver and the fireman, you learn how to fire the engine. and you learn how to oil the engine up, where to look, all this sort of thing. So it does take a few years before you get over to this side. What do I have to do first? What is the first job of the fireman? and three-quarters of water in the boiler. -The boiler is the most important thing on the engine. If we lose water, we go bang. I tell you what, the size of the coal... Look at that! That is a whopping great lump of coal! -I shove it in there? You guys have kindly got up at six o'clock this morning to sort this trip out for me today. You do it day in and day out throughout the season. Why do you do it? I thoroughly enjoy it. Somebody said to me, "What would you do if you won the lottery?" I said, "I would do what I'm doing now." It was always a passion. I always wanted to be an engine driver when I was out taking train numbers. -So I always felt privileged to get on a steam locomotive. -And what about you, Chris? If you didn't love the job, you wouldn't do the hours, because it's such hard work. -Need to put water in the boiler now. Would you like to do that? -Yes. It's about time I did something. Pull that lever there. That puts the water on. -And then you turn the steam valve anticlockwise. Yep. You might have to crack it. That's it. Back the way. And then we listen for the sound. That usually tells you it's picked up. -I can hear it whistling. and if there's no water coming through, you just trim it with that there. -As a fireman, you've got to think ahead all the time. -It's really hot just here. -And off with the water. When was the 305 class, this type of locomotive, decommissioned? -Well, it was never decommissioned. and it did come up this branch back in the mid '60s. where it actually ran their inaugural train up there in 1970, I believe. How many have survived? Do you know? -This is it. This is the only one that survived. -Wow! I was going to say, "Wow!" and he went, "Whoo-whoo!" This is the only survivor! That is quite incredible, isn't it? 'the journey to Totnes takes approximately 25 minutes, stopping only once, at Staverton. This is just beautiful. It's absolutely stunning. Nice time of the year to do this. -Yes, the leaves are just out now. Underneath a canopy of green foliage, this is the life. This is the life every schoolboy wants. I just love the smell. Everything about this journey is wonderful. -What sort of speed are we doing now? What would our braking distance be if we saw a cow or sheep on the line? -Probably about a quarter of a mile, safely. -Really? Quarter of a mile? I mean, there's a lot of weight here to stop, really, I guess, isn't there? That'll be enough now. Thank you. Lovely. What happens at the end of the day when you're on your last route and you have a boiler full of coal? Do you knock it out or let it die off gradually? No, I work in advance, think ahead. -and just about going out. You actually work non stop. You work harder than Chris does, really. -Drivers don't do anything, do they? o, he's got the responsibility of being the engine driver, and he's in charge of me, as well. Dave, thank you so much. And you, Chris. I've thoroughly enjoyed my day here. -and carry on enjoying the day. How did I do? 'So my job has finished, but Dave and Chris are still hard at it. 'and repositioned at the head of the carriages. Isn't that just stunning out there, the beautiful Devonshire countryside? Completely unspoilt, unchanged and not a trace of the modern world. And I must say, it's a lot warmer and quieter here in this second-class carriage. and getting on the train there and travelling to Surbiton. Wonderful times. 'The history of the line, commercially, it's quite a quiet one, really. 'and agricultural equipment and the local population. and, sadly, it closed on 3rd November 1958.
but that finished, also, in 1962. 'In fact, the 1960s was a defining moment for all the railways in the UK. 'became infamous for the reshaping and slimming down of a whole network. and thank goodness they did. It's been running ever since and it's keeping our heritage alive. and make this journey so special. It's well worth the trip. Love it to bits. I'm going to look out the window now. -It's your turn next, believe me. Welcome back to our valuation day here at the Pavilion in Exmouth. Let's now catch up with our experts and see what else we can find to take off to auction. us furniture experts or people who are geared towards furniture. It's often too big or bulky to bring in. -But no problem with this little piece. -What can you tell me about it? I bought it in a shop about 30 years ago now when I'd just moved into a new house. -Has anyone perched on it since then? -No, nobody's sat on it. -Because someone at some stage has and would have. because of the very vertical nature of the back, it would stop you from slouching. -Which is a natural position we fall into. -And you can tell someone has used it by the natural wear on the turnings here on the stretchers. -Can I ask you what you paid for it? -I think I paid around £50. Because, of its type, I think it's a rather nice one. we've got a nice top rail that echoes dining chairs of the time. -We're talking early 19th century to mid-19th, William IV, Victorian crossover. This carved rail, as well, that's a nice touch of quality. Someone's gone to the effort of hand-carving that. And, again, that echoes the dining chairs of the time. -You'll see a lot of dining chairs with that sort of splat on the back. -which is actually in good order, which is nice. -Looks like it could be original. It could have been replaced. But it's been done sympathetically. -And it's been done well. And then these long, elegant legs. -There's a nice little splay at the bottom. -It adds that little... It gives it that stability. -Yes, I particularly like that, the way it splays out. -That's another typical feature of the period. That little splayed front leg. And the wood itself is in beech. -..just by the way the wood is cut. -That's the way the rings appear on the surface. -just to simulate the rosewood grain. -Yes. That's interesting. I didn't know that. So if someone was sitting on it, you might just see the top rail. -So that's where they've made the effort to try and make it look more expensive than it is. -I mean, I like it myself. Do you like it? -Yes, I do like it. -Well, since I had that, parents have died and I've inherited various other chairs. There isn't really a lot of room left for chairs. As this one isn't used, I thought it made sense to get rid of that one. -..that would be a good ending to the story, wouldn't it? -You'd have had the enjoyment of it. So let me put the estimate at 40 to 60. -Perhaps I should have a reserve on it. -Let's put a reserve on at 30. -If it's not worth £30 then I say take it home. -It's got to be worth £30. -I'm pretty sure you'll have no trouble getting that away on the day. And thanks for bringing in a bit of furniture for me to look at. Chris, you brought this lighter in to show us. Tell me where you got it from. Well, I actually bought it in a jumble sale about 30 years plus ago. -I paid 50p for it. -You bought it from a jumble sale for 50p? -I took it home and cleaned it up and realised it was nine-carat gold. Absolutely, nine-carat gold, yeah. And it's got a wonderful maker's mark. -Did you recognise the name at the time, Dunhill? -I sent it away to Dunhill cigarette manufacturers in London. -And I asked if they could repair it, cos there was a pin broken on it. -They sent it back to me with no charge. -Oh, gosh, that was very generous, wasn't it? And also they offered me £100 to buy it for their museum. -Wow! So how long ago was that? -That's got to be about 30 years ago because I didn't have it that long. -I wasn't planning on keeping it anyway. But when they said it was £100, I thought I'd hang onto it, you know? Exactly. So why have you changed your mind about selling it? -and I saw you were down at Exmouth so I thought I'd bring it along just to see what it's worth now. Excellent. That's good news. They've done a very good job refurbishing it. -Not since I had it refurbished. -Fabulous, absolutely fabulous. And it's in very good condition. It's in nine-carat gold. We've got a nine-carat gold coat here. And on the bottom, all the information about it. Nice nine-carat gold hallmark there. Which is also hallmarked Dunhill. So the case was also made by Dunhill. Some of them weren't. Some were made by a different manufacturer, and they put the Dunhill name to it. also, rather than this oval shape, I have seen them in a facetted form. -I think it's really quite nice in its simplicity. -You bought it from a jumble sale, you don't know who owned it before? You would have been fairly affluent to have a nine-carat gold lighter. -From the hallmark, it's dated 1929. So it's from the late '20s. It's nice we can pinpoint the date accurately. Value-wise, we might be looking somewhere in the region of £250 to £350. How do you feel about that? -Good. Excellent. So would you be happy if we put an estimate of £250 to £350? -And a firm reserve of £250. How would you feel about that? -I was thinking more a £300 reserve. So we'll say £300 to £400 with a reserve of £300. I hope that's not a little bit too high, it might be, but let's keep our fingers crossed. -I could always keep it and it would go up in value. -That's very true. It will not go down in value. -Brilliant. Thank you very much for bringing it in. -We look forward to the auction. -Hopefully it will be very successful for you. 'Whatever happens, you're onto a winner, Chris. Well, Jean, you've come in today with a real Aladdin's cave here of various gold items. -Tell me, have these come out of your own jewellery box? -No, I inherited them many years ago. Inherited pieces, OK. So you're not going to feel a pang of sentimentality when you sell them? -Was it a close family member? -No, not at all. I think I met the relation once as a child. So there's no sentimental or emotional attachment to them at all. which I've had a closer look at and is marked 15-carat gold, so a reasonable purity of gold. -..tied on this strung necklace. -Never been tempted to wear it? -No, I think it's hideous. I don't like it. -There's me talking it up. What about this? I don't think that's going to be in your pocket, being a gent's watch. And the condition of it is rather poor. Was it like that when you inherited it? -I think it was, yes. It's never worked since I had it. -all the value in that is in the 18-carat gold case. Then over here we've got various little charms and sweetheart brooches on this little bracelet. -Again, when was the last time you ever wore a charm bracelet? -They've really fallen out of fashion. -But good news is, they're nearly all nine-carat gold. -So that has value in the material value of what they're made of. These little sweetheart brooches are nearly always nine-carat gold. You see a lot of those, late-Victorian period. And then here a little charm that perhaps fell off a bracelet. Or maybe was on a chain as a little pendant locket, perhaps. but with the price of gold being so high, these are literally going to be weighed in, I'm afraid. -And their value is purely in what they weigh. you're probably looking at £300, that sort of level for the case. -It's a lot of money, isn't it? For really not a lot of gold. you're probably looking at, say, £100, £150. And then for the 15-carat gold necklace, again, you're probably looking at around the £300 mark. So if we think we are looking here at £750-ish, that sort of level. but a lot of the buyers of these things will go to the sales armed with their digital scales. -And they will weigh the items there and then. So they know exactly where to bid. You have to allow a bit compared to the bullion price, bearing in mind that buyers pay a buyer's premium. -I'm pretty confident we will see these away. How do you feel about that as a level? What's the money going towards, maybe some jewellery you do wear? -I think a nice holiday. -Oh, very nice. Let's swap this gold for the goldy, sandy beach, how's that? -I'll see you on the day. -I saw you in the queue this morning. It was very blustery outside, you had a big box of things. Then you came up with this little gem. It's come from her family, passed on from her Great Aunt Julia. So this is on your wife's side? And do you know what it is? and told me it was a vinaigrette. Ah, there we go. Do you know what they were used for? and it would bring lightness back to your life. This is the most wonderful vinaigrette. and also the banding has been selected to create these wonderful striations here. you have this beautiful silver gilt grille. and the date letter is for 1850. And we have those magic initials NM. who, for vinaigrette collectors, is the creme de la creme of makers. and his vinaigrette or small working firm had passed to his sons. his sons have really maintained his standards. And he still is popular today with vinaigrette collectors. which you will have had your initials or name or some sort of dedicatory inscription in. but this has been left vacant. because they can actually have their own put in, so that's fantastic. Tell me, John, why are you selling it? My wife has literally said, "Well, I don't need it." -And it's better to go towards something else that she might want to buy. Some other jewellery, modern jewellery. -Sensible woman, I like that. with a reserve of 150 with some slight discretion. but I do have some concerns about the condition. I feel fine about it. I think my wife will be happy about it as well. -You think she'd be OK with that, do you? Oh, good, I'm pleased. She does know that you brought it, doesn't she? Oh, yes, she knows I've brought it. Well, I wouldn't want to be in your shoes if she didn't. So how do you think our experts' valuations went? and here's a quick reminder of what we have chosen. Picked up for 50p at a jumble sale and hopefully it's going to achieve £300 to £400. Chris, good luck. -Christina, these are the stories we love. -I know. Isn't it wonderful? -Nine-carat gold, George V. Why are you selling now? -It's been in a drawer at home for 30 to 40 years. I saw your programme in Exmouth and thought I'd see how much it's worth. -And we're going to find out right now. -Hopefully we get that top end. -This is it. It's exciting. 200, thank you, at £200. At 200. At 220. 240. 60. 280. 300. At £300. Where's 20? At £300. -It's sold on the reserve. We did it! That's not a bad return on 50p. Put it there. -That was a bit tight, wasn't it? -It is a roller-coaster ride. -Well done. There's commission to pay, don't forget. It's 16.5% plus VAT. 'it's a result that would have any of us on the edge of our seat. It's a lovely example. It belongs to Sally. We're not looking for a lot of money, are we, Will? £40, £50. Condition is really good. I like the bar back. It's nice and high. Makes you sit straight. -Why are you selling today? -Well, I've inherited quite a few chairs since I bought that one. -And I need to do a bit of work on the ones I've inherited. -So one has got to go. -One has got to go, really, so hopefully it will. Let's find out, shall we? And hopefully we'll find a home for it. Here we go! -and I've two bids at £40. -Two bids straight in at 40. At £55. Where's 60? 60. 65? In the room against the reserve. -And I sell, then, at £65. Sally, it's a good result. Hammer's gone down, £65. Good, clean example. -then the furniture market really would've been in the doldrums today. -Good. Good. And thank you for bringing it in. The original valuation - 600 to 800. -Gold prices have just gone whoosh recently. -I know the auctioneer's had a chat to you on the phone, hasn't he? The new estimate is £900 to £1,300. You've got to keep your eye on those gold prices, haven't you? -Yeah, it is, isn't it? If we wait another ten minutes, hopefully the gold prices will go up even more. It's going under the hammer right now, this is it. a chain and a book-form locket. And I'm bid £750. At £750. At 750. At £750. 800. -I can't see who's bidding. -Someone's left a bid on the book. -or you can leave a bid on the book. 1,300. At £1,300 near me. -Top end of the estimate. -Selling now at £1,300. You all done? -Oh, you must be so made up with that. -Worth getting up this morning. 'I'm sure Jean will be packing her suitcase and feeling the sand between her toes in no time at all. -Well, it was Great Aunt's. -Sad to see it go? That's the answer we like. We're here to sell things, not keep things. -But I'm sure you have other things in the house. and what you would expect of Nathaniel Mills. so hopefully we'll find some good bidders that will want it. It won't be in the saleroom for much longer. -We'll start here at £180. That's straight in at the top end. 230, with me. 240, 250. In the room. Yeah, At £290, I sell. -A man that loves you, there you go. -Thank you for doing the valuation. How about that? Most people have gone home happy. That's what it's all about. As you see, the auction is still on. We've had a terrific time here at Exeter. Thanks to everybody here for looking after us. I can't wait to come back. 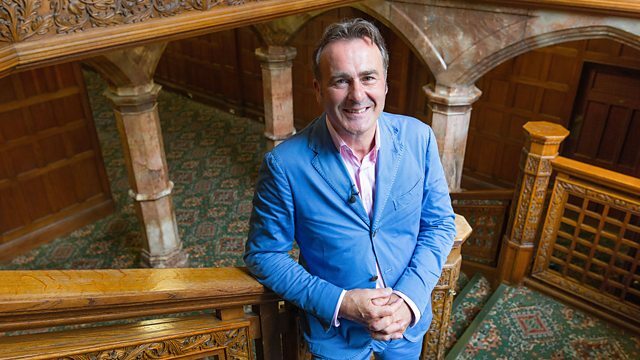 But until then, join me again for many more surprises on Flog It! Bye-bye. Paul Martin and the team are in the seaside town of Exmouth. Clutching their bags and boxes and not their buckets and spades, the locals turn out in force, giving experts Christina Trevanion and Will Axon an array of antiques and collectibles to take a look at. Christina discovers a solid gold lighter bought at a jumble sale for 50p! Will lights up after spotting a 19th-century watercolour of an attractive lady. Paul also takes a trip back to the age of steam when he visits the South Devon Railway.